Gourmet seafood gifts that really deliver! Place a seafood order and select your own convenient delivery date. Whether for a birthday, a special anniversary, employee recognition, or a corporate or holiday gift, a Legal Sea Foods gift card is the perfect gift. 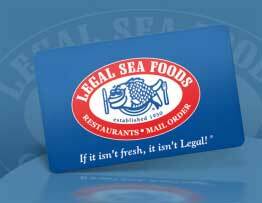 Legal Sea Foods gift cards do not expire and can be used online and in any of our restaurant locations. Gift card orders are processed within 48 hours after your order is placed, and they are shipped Monday-Friday. 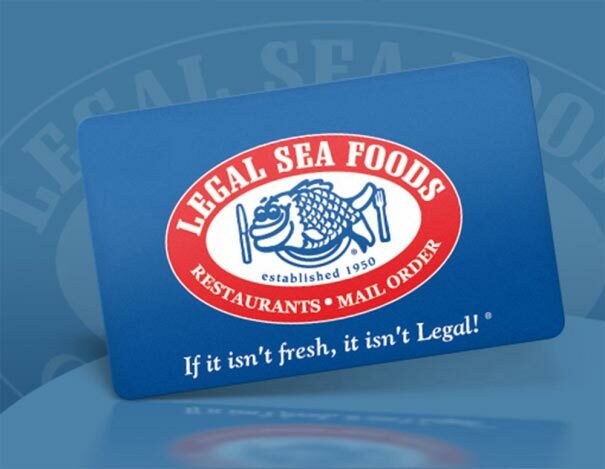 Legal Sea Foods gift cards are non-returnable and non-refundable. Contact us at corporategiftcardprogram@legalseafoods.com to learn more about our Corporate Gift Card Program. We have enjoyed the food for years. The Clam chowder is delicious! I purchased a gift card for my son who lives in California but he is visiting Boston in August and he insists on stopping in to enjoy his favorite chowder in the world. I ordered a gift card ....the response was quick, accurate, and excellent. A very easy way to surprise good friends at the holidays! Gift Card Purchase was a Breeze!!! I purchased a Legal Seafoods gift card on-line. I'm technically challenged and the process couldn't have been easier...plus I received it in the mail very quickly. Thank you Legal Seafoods!! We get gift cards for our Mom each year & then she hosts a family Lobsterfest and the live lobsters come the day she cooks them. The quality of the produce is always wonderful! I left the gift certificate in a little card in my husband's truck today as he was making his annual pilgrimage to go Christmas shopping. Part of his tradition is to stop at Legal Sea Food for lunch. He was pleasantly surprised and I know that he will enjoy his Christmas lunch!! Excellent food, service and employees. The best gift is your Gift Card to enjoy a wonderful meal. I have many family members still in Massachusetts. It was great to find out that I could order Legal gift cards, get them very quickly and be able to put them in the Christmas cards that I was sending out. This truly made my holiday. Thank you for sending the Gift Card I ordered to my son. He lives on the West Coast and I, on the East Coast, so I depend on online ordering to send him gifts. The only request I would like to make is that you send me a notice of shipment next time I order and also would suggest you send the gift card to the recipient with a return address rather than in a plain white envelope....that is too easy for the recipient to think that it is junk mail and might possibly discard the gift without even opening it. I corresponded with you to see if the order had been shipped and got a very nice phone call letting me know the date it had been sent and was also told it was sent in a plain white envelope. I texted him immediately to let him know not to throw it away as junk mail and fortunately he received the gift (in a plain white envelope) the next day. He said he might have thrown it away as junk mail if I had not texted him. Just a suggestion to mail the cards with a return address at least. My son and his wife are frequent customers of yours and do appreciate your seafood. Thank you! I ordered 2 gift cards, on line, only received one. Called next day and they did overnight me the second card. Good thing I looked, as I needed right away. Disappointed, but it was resolved, Shane cause i paid for 2 up front. The gift card purchase was a big hit with my brother and sister-in-law who live in the Boston area and are usually difficult to buy for. Overall, it was a great gift purchase. We ordered a gift card for Christmas and it was super easy on the website and a card arrived in the mail a few days later - easy and secure! I ordered gifts cards online for my son's probable future in-laws who enjoy dining at a nearby Legal Seafood restaurant. The website was easy to use and the gift cards were delivered promptly and were really appreciated. Love your food and ambiance. The card was a birthday gift for my son who specifically requested a Legal Sea Foods gift card. The whole family loves you! Ordered a gift card and it was in our mailbox in a flash. Thanks for the prompt shipping! Gift card and gift certificate orders are shipped out within 1 business day and are only shipped Mon-Fri, excluding major holidays. Non-perishable items normally ship via a Ground Ship method and they are delivered in an estimated 1-5 business days. Additional shipping methods are available above. Packages without live items normally ship via a 2-Day ship method with dry ice and they arrive within 2 days of your chosen target delivery date. Dry ice may freeze fresh food during transit. 2-Day deliveries are made Wednesday-Friday. Additional shipping methods are available above. Packages containing live items normally ship with frozen gel packs and they are shipped via a Standard Overnight ship method. Standard Overnight deliveries are made Tuesday-Friday. Additional shipping methods available above.